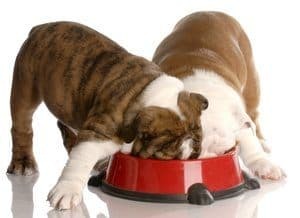 How Much Food Should My Bulldog Eat? What Food Should My Puppy Eat if it has allergies (i.e., skin allergies)? What if my Puppy has a Sensitive Stomach? What if the Food My English Bulldog Puppy Eats, causes it to fart? Do you have a picky eater? You know, like an English Bulldog? Or do you just want to make sure you have the highest rated food for your English Bulldog? 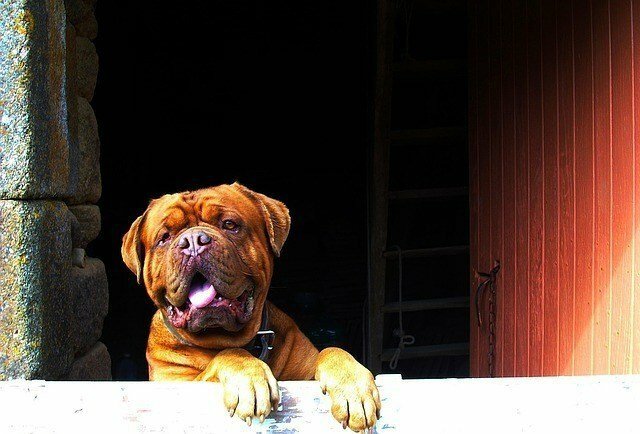 As you know, this type of breed is known to be loyal, are good guard dogs, affectionate, and most importantly, adorable. 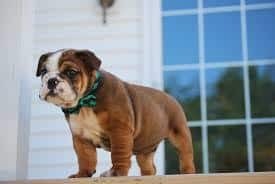 But one aspect of owning an English Bulldog puppy that people overlook is that they are known to have sensitive stomachs and allergies to certain foods. So, to help your puppy live a long healthy life, make sure its diet consists of the proper amounts of macronutrients. Macronutrients are the building-blocks of a long and healthy life. 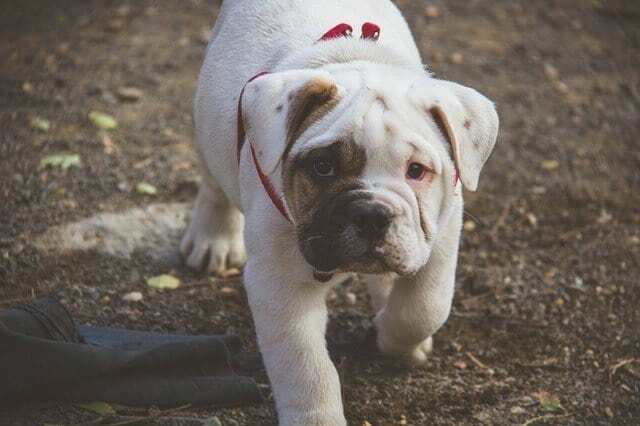 Whether you’re feeding your English Bulldog dry food, wet food, snacks, or treats, make sure you give them the proper amounts of protein, carbohydrates, and fats. It’s not hard to keep your dog on a strict diet, and you’ll surely see the benefits in your pet’s quality of life. As your pet grows into its twilight years, its diet will change. 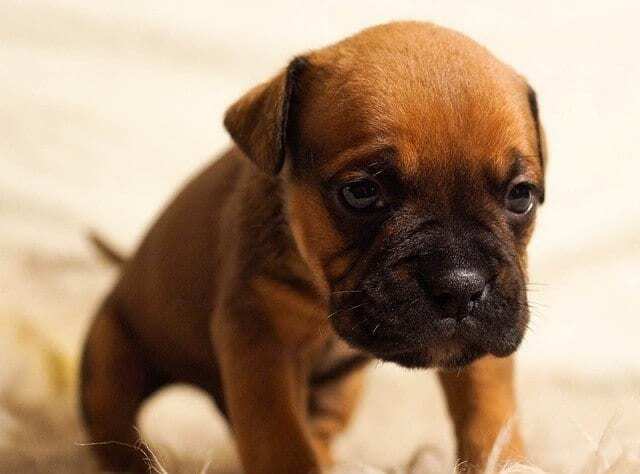 The overall goal for your puppy is for it to have sustainable and manageable growth, but if you feed it more or less than what experts suggest, then you risk your dog developing illnesses or other disorders, such as hip dysplasia. Compared to other breeds, an English Bulldog is more susceptible to weight gain, and find it harder to shed. Proper amounts of protein are vital to an English Bulldog’s growth and development. However, they don’t require as much protein as other breeds and are more prone to obesity. If you feed it foods with high amounts of protein, then you increase the risk of kidney stones, cardiac disease, and hip dysplasia. Keep in mind that any unburned calories convert into fat. When your pet is in the puppy stages, feed it lower levels of protein, remember, we don’t want our little friend to grow too fast. Also, make sure their diet includes calcium and phosphorous to promote healthy growth. 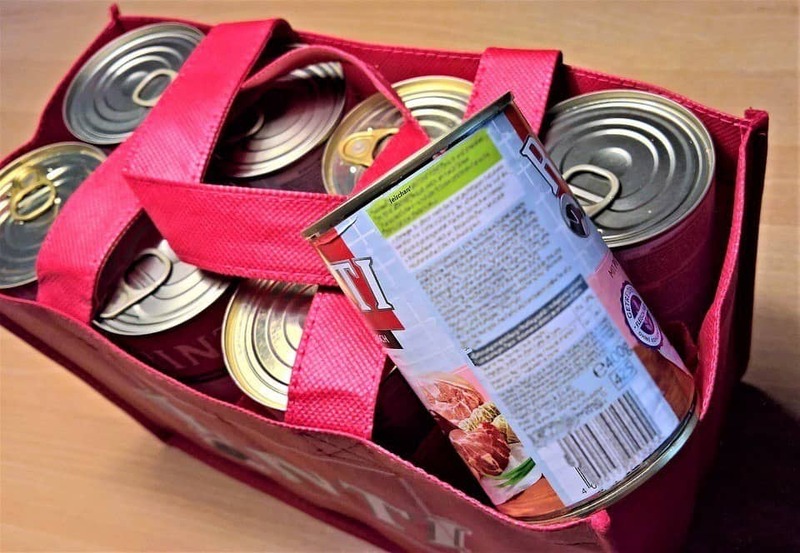 In addition, check the crude analysis label on the back of the dog food package; the goal is to feed it food with around 20% protein. Your pet’s food should contain a crude fat percentage of around 8% and 15%; this is a safe enough portion to help them maintain healthy body weight, without risking obesity. Also, fatty acids are essential for your dog’s coat and skin. 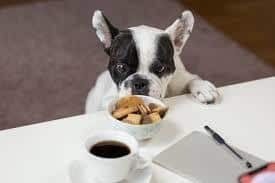 Fats are also used as a source of energy and promote the absorption of fat-soluble vitamins, such as vitamins A, D, E, and K.
Carbohydrates are also sources of energy but are not part of a dog’s natural diet. Keep in mind that most of the calories from carbs rapidly convert into fat, so moderation is required. 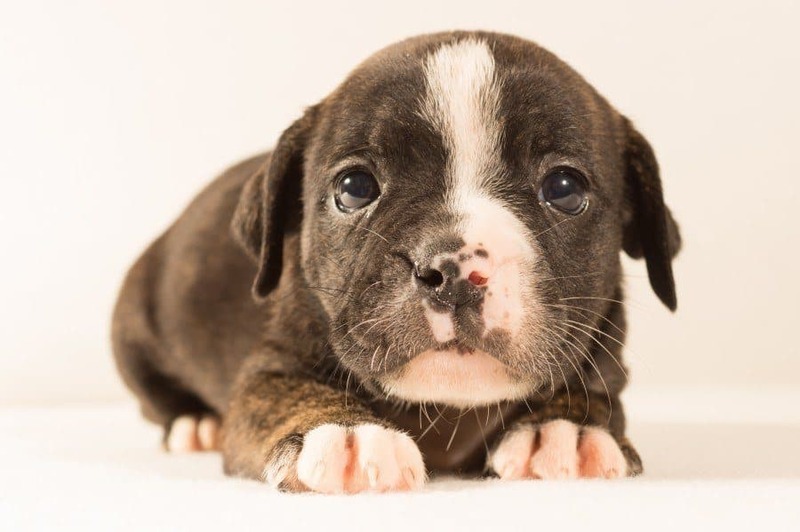 A typical scenario is owners would notice severe swelling in their pup’s frame and food allergies, which was a result of eating too many sugary foods. The kind of food you choose for your bulldog depends on its lifestyle and stage of life (i.e., puppy, senior dog). Each type of food, wet or dry, has its pros and cons, and the decision ultimately comes down to your preference. Some owners give their pet a mixture of the following foods to have the benefits of both. Wet dog food has its benefits. For instance, due to its higher water content, it helps keep your dog hydrated, primarily since they’re known to be active breeds. Also, the higher water content in wet food will help your Bulldog feel full faster but still provide it with the proper nutrients. However, some negatives are that wet foods have shorter lifespans and spoil quickly, are pricier than dry food, and messier. We typically like to put our dog’s wet food in specialized water bowls as well. Overall, dry food is easier to store and travel with and is cheaper in comparison to wet food. Its dry texture helps prevent plaque and tartar build-up in the teeth. In general, dry foods have a lower fat content than wet foods, which is key to an English Bulldog’s diet. But beware, check the content of your dry food package and make sure you’re not feeding it unnecessary ingredients. Some brands use unhealthy meat byproducts rather than quality protein or spray their dry food with animal fats to increase flavor and shelf-life. Also, dry foods tend to include useless fillers or gluten to cheaply increase protein levels. Keep in mind that animal protein will provide higher nutritional value. On all dog and puppy food packages, dry and wet, come with a guaranteed analysis of the crude amounts of protein, fats, and carbohydrates. In the table below, we went ahead and provided a range of what one can expect in terms of the crude percentages of macronutrients, for both wet and dry dog and puppy foods. In general, many grain-free dog foods use higher-quality ingredients, such as real chicken, beef, whitefish, salmon, turkey, tuna, and eggs. 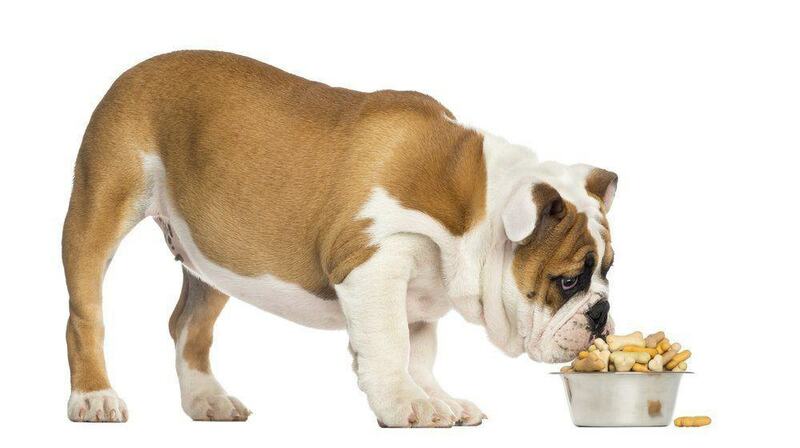 Protein is the most crucial ingredient in your bulldog’s diet, especially for puppies. Protein from animal sources, rather than grain sources are the most complete, easily digested, and deliver the best biological value. 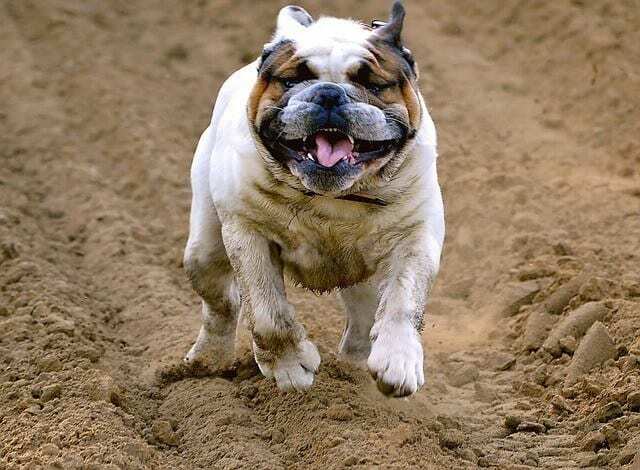 Whereas grains are full of carbohydrates, which remember, is not a natural part of the bulldog’s diet. Also, due to some English Bulldog’s are sensitive to grains and will have an allergic reaction if consumed. But grains are not completely terrible and provide some benefits to a dog’s diet. Although grains are not a natural part of a dog’s diet, they do contain essential minerals, vitamins, and healthy bacteria, like probiotics. Continue reading to see our top suggestions. Ketona has developed a first-of-its-kind, dry food for dogs, with the low carbohydrate content of a raw-ingredient diet, but the cost and convenience of kibble. This food contains more than 75% fewer carbohydrates than leading “grain-free” kibbles. It also includes more than 46% protein. This food is complete and balanced for optimal nutrition and made in the USA using natural ingredients and non-GMO chicken. Customers that have strict raw-diets for their pooch call this kibble the perfect substitute when traveling. Some concerns about this product is that the price may be a little high, but you’re receiving a quality product. Also, due to the chicken contents, it may cause food allergies for some English Bulldogs. Lastly, some were concerned that the protein content might be a little high for senior dogs. Wellness food products are well-known and consistently receive praise among dog owners. This product is made in the USA, 100% grain-free, all natural, and complete and balanced with everyday nutrition for your English Bulldog. Depending on the formula you choose, they are rich with delicious premium proteins. For example, its Ocean Formula contains whitefish, herring, and salmon, combined with real vegetables and essential vitamins and minerals, such as antioxidants, omega fatty acids, and probiotics. This dog food does not contain any wheat, corn, soy, meat by-products, or artificial colors, flavors, and preservatives, which are known to be harmful. We strongly suggest speaking to your veterinarian to ensure the protein and flavor you choose will not cause an allergic reaction, vomiting or diarrhea. Nulo Grain-Free dry dog food is 100% natural, and a premium blend made without white potatoes, tapioca, and other fillers. 85% of its protein comes directly from animal sources, ensuring nutritious protein instead of allergy-causing plant-based proteins. Other companies try to unhealthily pack in corn, wheat, soy, rice and barley as cheap substitutes for real meat and protein. They source only from quality protein in their Lamb & Chickpeas, Salmon & Peas, and Turkey & Sweet Potato recipes. Nulo does not use any chicken in their recipes. This food is perfect for small and large dogs, and the kibble is packed with animal-based protein, and Nulo’s patented BC30 Probiotic to give your English Bulldog energy all day long and natural digestion. Lastly, this dog food features Omega-3 and Omega-6 fatty acids to nourish your dog’s skin and help promote a beautiful, shiny coat. Omega 3 and six fatty-acids promote beautiful, shiny coat. Zignature believes simplicity is the key to deliver high quality, healthy, and well-balanced diet and they got it right with this product. This dry food utilizes a single animal protein formula and is extremely palatable, encouraging a healthy appetite and providing high-quality protein for strong muscles. This grain free dog food is an excellent source of antioxidants, heart-friendly Omega-3 fatty acids, and rich in low glycemic carbohydrates, making this the best food for your English Bulldog. The limited ingredient formula does not use any potatoes, grain, chicken, eggs, gluten, tapioca, corn, and soy. Customers have raved about its effectiveness for dogs, especially English Bulldogs, with food allergies. This grain-free, high-protein dog food is gluten-free and perfect for the pickiest of eaters. This kibble does not contain any chicken, which is known to trigger allergies in English bulldogs. Instead, the high-protein content comes from lean red meats, like lamb and bison, which are easy to digest and rich with amino acids. This product combines antioxidant nutrients, like Vitamin E and C, with nutrient-rich vegetables and fruits, such as peas, blueberries, cranberries, apples, carrots, and spinach. These nutrients help support the immune system and other bodily functions. This dry food contains Omega-6 and Omega-3 fatty acids, which healthily maintains your dog’s skin and coat. It utilizes L-carnitine to help convert body fat into muscle and energy that supports lean muscle mass and overall body conditioning. These treats are all-natural, made without any preservatives, fillers, coloring, or artificial flavors. Green Butterfly uses 100% American sourced human-grade organic beef and beef liver, which include lots of protein. This product is excellent for dogs, especially English Bulldogs with sensitive stomachs. They are low in fat and calories and don’t contain any gluten, wheat, or grain. It is the perfect training treat for large and small dogs. Their crunchy texture is ideal for keeping your pet’s teeth clean. As a company, Green Butterfly is top-notch. They are actively committed to supporting our US veterans. They donate portions of their proceeds to train service dogs for disabled veterans. This product comes from Brazil, and each pack comes with three sticks. These are premium grade beef sticks, sourced from grass-fed, free range cattle. There are no hormones or antibiotics in these beef sticks, resulting in a healthier and better-tasting treat. The company ensures safety and quality of each bully stick by handpicking and inspecting each one. They are all natural beef, low-fat, protein-rich (75%), and guaranteed not to cause any side effects. The company’s production techniques ensure all bacteria is eliminated and there is no cross-contamination. Thick Bully Sticks are never stretched, resulting in a 60% thicker than the standard bully stick, thus lasting much longer than regular bully sticks. Keep your dog occupied for many hours, while chewing away on this savory beefy and flavorful dog treat! By ensuring its’ consistently perfect texture and thickness, Baxter Boy Bully sticks texture helps keep the dog’s teeth healthy and clean. Effectively removes tartar build-up, strengthens the gums, removes plaque and promotes an overall enhanced oral health. Prepared by boiling, roasting, and smoking; then drying in a slow process. The multi-step process effectively locks-in the natural beef flavor, naturally eliminates all odors, without the use of any additives or chemicals. They stay fresh longer without any added preservatives. Some customers believe the size of the treats are rather large but have simply cut the treats to create smaller portions. 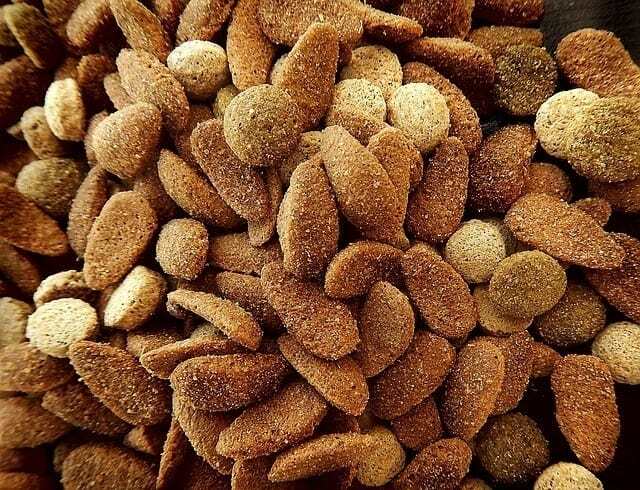 These all natural, single-ingredient dog treats are sourced from duck liver and made in the USA. Duck liver is an excellent source of vitamins, minerals, lean protein, low in carbohydrates, and great for bulldogs with sensitive stomachs. These treats are grain free, gluten free, and contain no preservatives, artificial colors, additives or fillers. These Treats are dehydrated to perfection, at a low temperature, for 24 hours. Be sure not to go overboard and give too many liver treats because they could potentially cause diarrhea. corn-based products – very little nutritional value and can add up to as much as 70% in some low-quality puppy food brands. Chicken and bone meal – bone meal is the inedible pieces of an animal that your animals can’t digest, such as chicken feet. A common disability among English bulldogs is hip dysplasia, which is when the hip joints do not correctly develop. The hip joints lack the proper cushioning and begin to deteriorate, and your pet will slowly lose mobility and develop arthritis. Hip dysplasia is typically a genetic disorder but can be avoided if given the proper foods. If your dog does have hip dysplasia, you should avoid putting them inside their crates, as it reduces their activity. For instance, feeding your pet too much, too fast with wrong ingredients, can lead to obesity which can overwhelm your dog’s musculoskeletal frame. 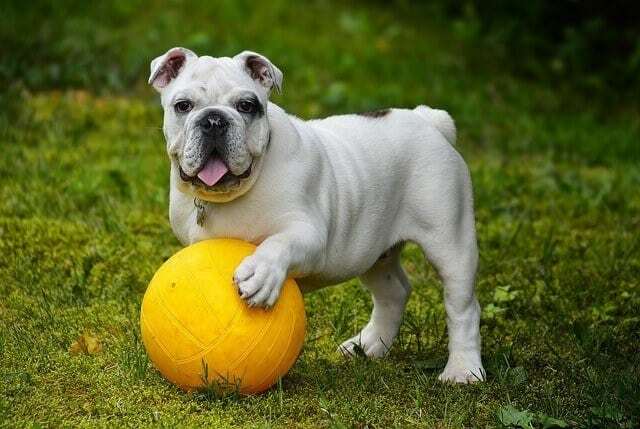 English Bulldogs are muscular, stocky, and can weigh anywhere from 40-55 pounds, depending on its gender. They are full of energy and burn calories faster than other breeds. A good rule of thumb is that your pooch should consume around 25-30 calories per pound it weighs, which averages out to 1300 calories a day. 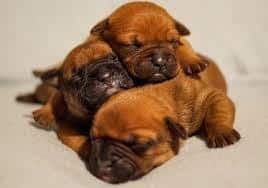 Then as your puppy up there in age, scale the caloric intake down to about 1000 calories a day as it becomes less active. Those calories should be spread out among 2-3 meals daily. Your Bulldog’s diet will vary and depend on its age, allergies, and current health condition(s). So the best thing to do is monitor your pet and how it reacts to the diet change. Research shows that probiotics such as Lactobacillus acidophilus can reduce the likelihood of allergies developing. Probiotics are inexpensive, safe to use, and can prevent costly trips to the veterinarian in the future. It’s also suggested to feed your bulldog foods that contain healthy fats and Omega-3 fatty acids, which also play an essential role in treating skin allergies. Try to incorporate fish oil, coconut, or freshly milled flax seed into your pet’s diet to promote healthy skin and prevent allergies. Getting Rid of Anything Hard to Digest in the Diet, such as gluten, wheat, and corn. Substituting those ingredients for more stomach-friendly ones, such as oats, venison, turkey, brown rice and non-dairy products can significantly reduce the stress on your puppy’s gut. Feed them brands that use limited recipes with limited, high-quality ingredients. Flatulence in English Bulldogs can be attributed to their diet. Also, their shortened face may worsen the problem because as they chew and eat, they take in a lot of air, which adds to the problem. This problem can be solved by having your bulldog eat slowly, by feeding it small kibbles. Some other foods to avoid that will prevent flatulence in your bulldog are soybeans, peas, beans, milk products, and fatty or spicy foods. Due to their anatomy and physiology, an English Bulldog has a special diet. For some English Bulldogs, to make the matters worse, have food allergies or sensitive stomachs. 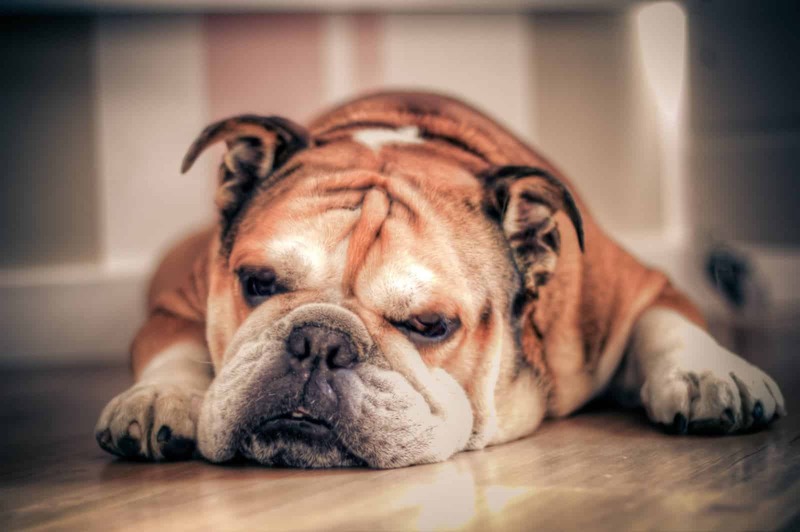 The aforementioned dog and puppy foods are just recommendations, but we suggest you choose one based on your preferences and your pet English Bulldog’s needs. Always observe your pet after making a diet change to make sure they’re reacting appropriately and that there are no side effects. We strongly endorse the Nulo Adult Grain-Free Dry Dog Food. It provides everything your canine needs to live a long and healthy life. It is grain free and all-natural Ingredients. It uses high-quality proteins such as salmon and excludes proteins that may cause allergies or upset sensitive stomachs such as chicken and bone meal. It is ideal for weight maintenance and contains probiotics to aid in digestion. The omega 3 and six fatty acids support a clean and healthy coat. 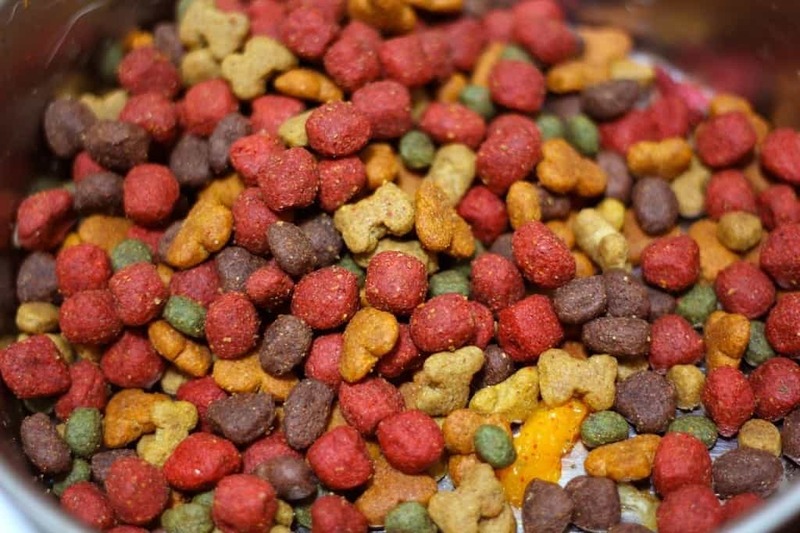 It may be expensive, but you’re receiving high-quality food for your pet. 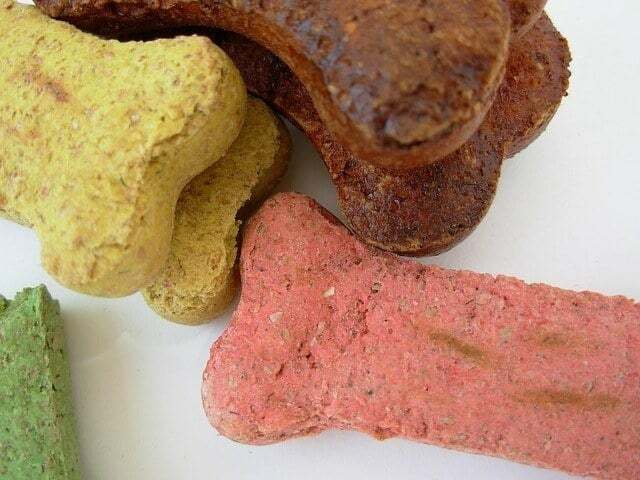 The dog treats we recommend for 2019 are Green Butterfly Brands Organic Grain Free Dog Treats. They are all natural, which means no preservatives or artificial flavors. They’re low in fat and calories but packed with high-quality protein, consisting of human-grade organic beef. It’s great for dogs with sensitive stomachs and skin allergies too. 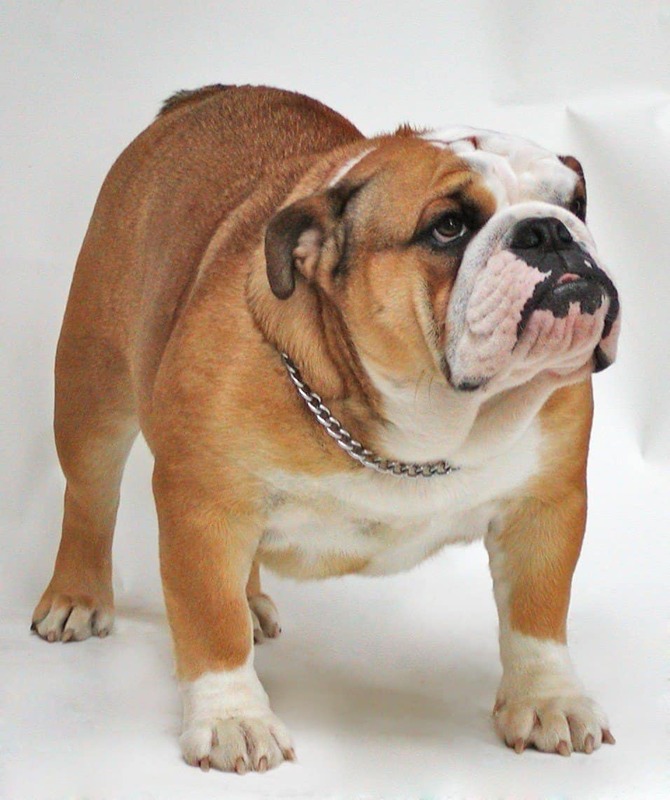 We hope that you’re able to identify the top English Bulldog food with our guide.